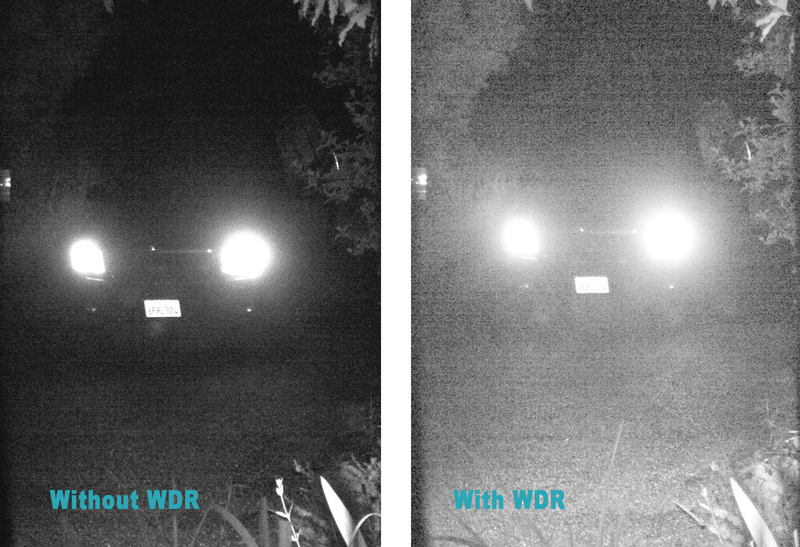 Wide Dynamic Range WDR examined. Wide Dynamic Range a.k.a. High Dynamic Range is one of the hottest subject concerning surveillance cameras. Some of the people I talk to will choose a camera with a number of functional shortcomings just because it is believed to have the all important High Dynamic Range. So I decided to investigate. A photo with some areas in sunshine and others in shade will not be able to show both areas well, either the bright area will be lit correctly and the dark area will be under-exposed, or the dark area will be lit correctly and the bright area will be overexposed. Technically it is very hard to expose different parts of the scene with different opening times. Wide/High Dynamic Range is an attempt to do the impossible and expose different areas different. Axis Wide Dynamic Range Sample from their homepage. Axis has a white paper describing the different ways to achieve wide dynamic range, and the pros and cons of the different methods. Link at the bottom of this page. To test the WDR function of the Axis P1347-E, I enabled Wide Dynamic Range in the Axis interface, there is a sub-setting with a range from low to high, I experimented shortly with moving the setting all the way to low and all the way to high, but was unable to detect any visible difference in the images, so I left that at its default setting which was the middle. 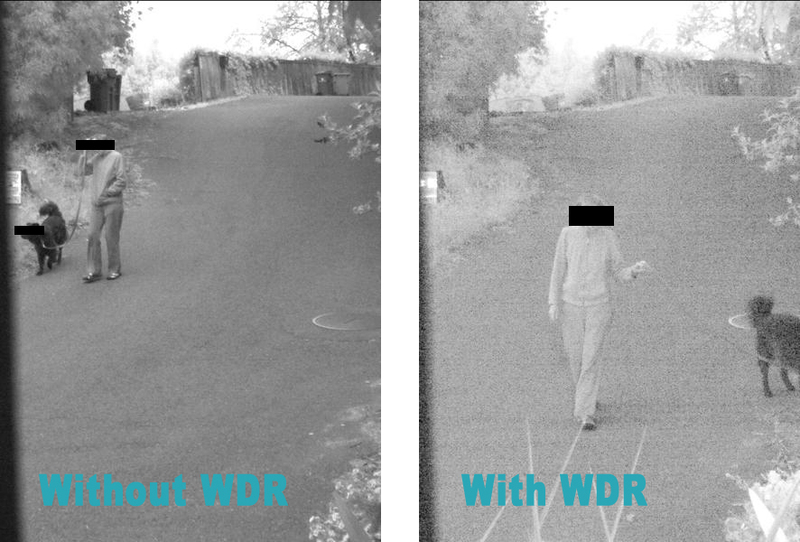 I then left the WDR on for 1 week, and then set out to collect comparison photos. A set of comparison photo would be two photos that showed the same scene, with and without WDR, The jobs turned out to be a lot harder that I had though and I ended up having to drive my car past the camera in the end to get that last good comparison set.. Day scenes were especially troublesome, when I found the same car on two photos 1 week apart, the weather would not be the same, a comparison between a sunny day and a cloudy day would be useless. The Postal truck was nice, it comes at the same time every day. 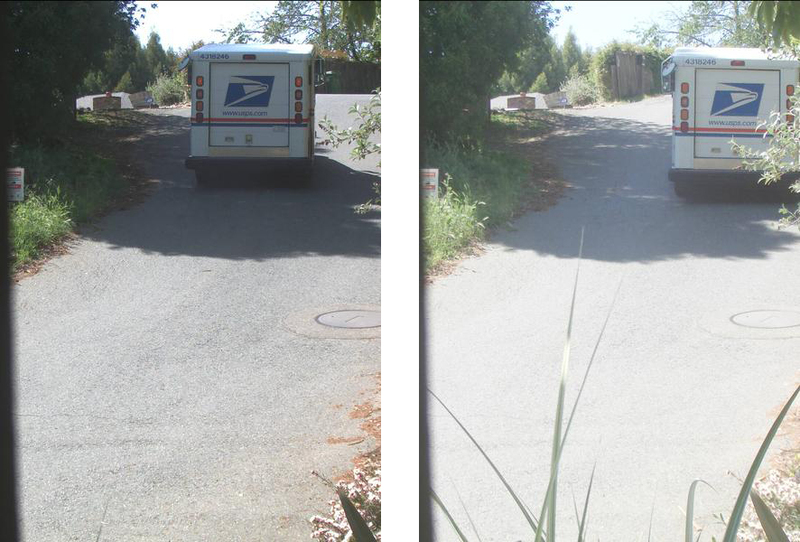 WDR should enhance the US Postal Van is in shade. And it does, the postal van in the shade is slightly lighter with WDR. However we lose details on the rest of the photo and while lighter the WDR does not give us any additional details on the Van. Too bright for night vision and too dark for day vision, sunrise and sunset are traditionally times of the day that are hard to capture on surveillance cameras, what will the Wide Dynamic Range do? it was really hard to find comparison photos as the twilight period in northern California is only a few minutes long, and here in the spring the sunrise it at an earlier time every day. Looking at the clothes it is obvious that the WDR setting reduce the level of details, Looking at the black dog and the asphalt, one can see how the WDR setting introduces noise pixels. The night is where most cameras has a hard time recording license plates, and distinguishing car models, so I was eagerly anticipating the result of the night comparisons. The good news for this test is that the light is pretty consistent at night compared to day (consistently dark that is). WDR reveals more details on the vehicle, and on the far side of the street, however the license plate that could not be read before still cannot be read. 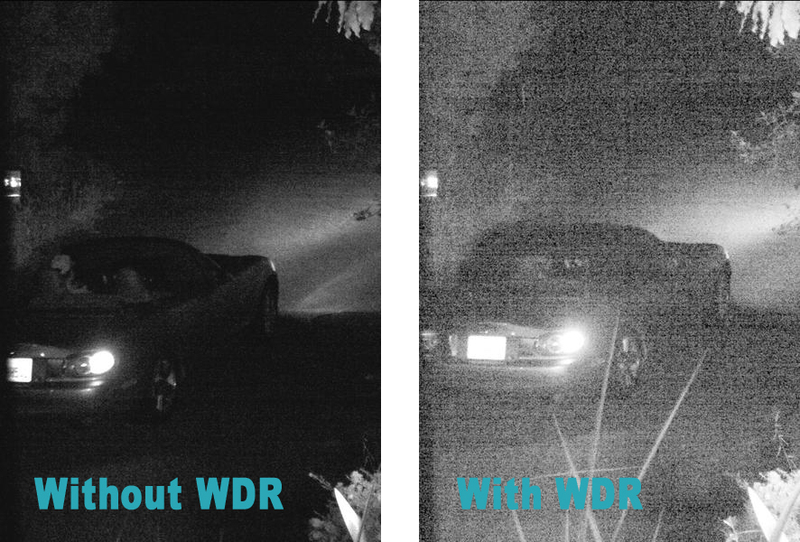 With WDR the noise washes out the details of the car and driver (convertible roof on in the 2nd photo), without WDR we can see a part of the license plate, but with WDR the license plate is completely washed out. Blinding headlights makes it hard to see a license plate at night, how would the Wide Dynamic Range fare here? WDR does not give us any additional details, instead it almost washes out the license plate that could be clearly read in the photo without WDR. 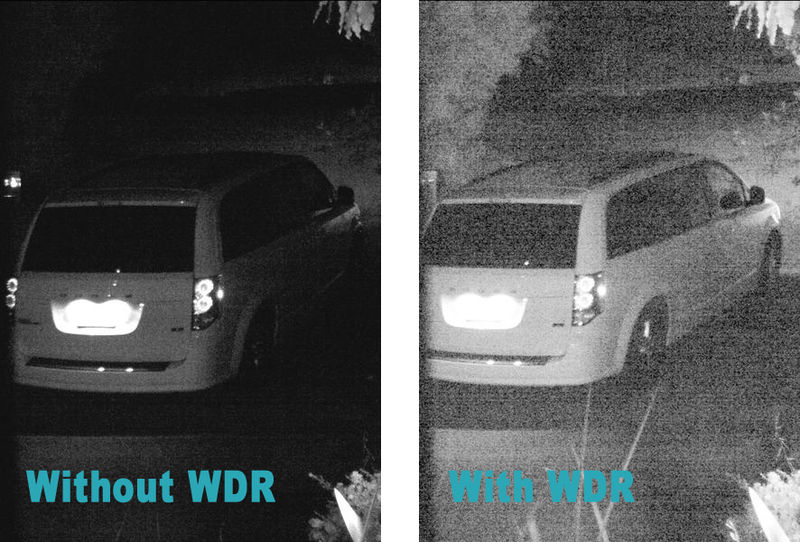 Based on the last comparison sample, and a feeling I got from examining thousands of photos looking for comparison samples, I decided to do an actual count of the license plate readability in darkness for 2 nights (1 without WDR + 1 with WDR), my initial feeling was confirmed by the hard numbers: when measured over 87 night vehicles with license plates, the readability fell 33% when enabling WDR. Wide Dynamic Range from Axis as implemented on the P1347-E holds a lot of promise but fails to deliver on key practical points. Camera is excellent both day and night without WDR, and has the key ftp push feature that is crucial to our implementation. The camera will continue to be our favorite camera, but WDR stays turned off.